Springfield. VA – February 21, 2017 – Cornet Technology, Inc (Cornet) is pleased to announce that it has been awarded a subcontract from Eastern Shipbuilding Group (ESG) for the design of an Exterior Communications Systems (XCS) for the U.S. Coast Guard Offshore Patrol Cutter (OPC) program. The subcontract encompasses the exterior communications detail design effort as well as shipsets for the first nine cutters to be built in ESG’s two Panama City shipyards. 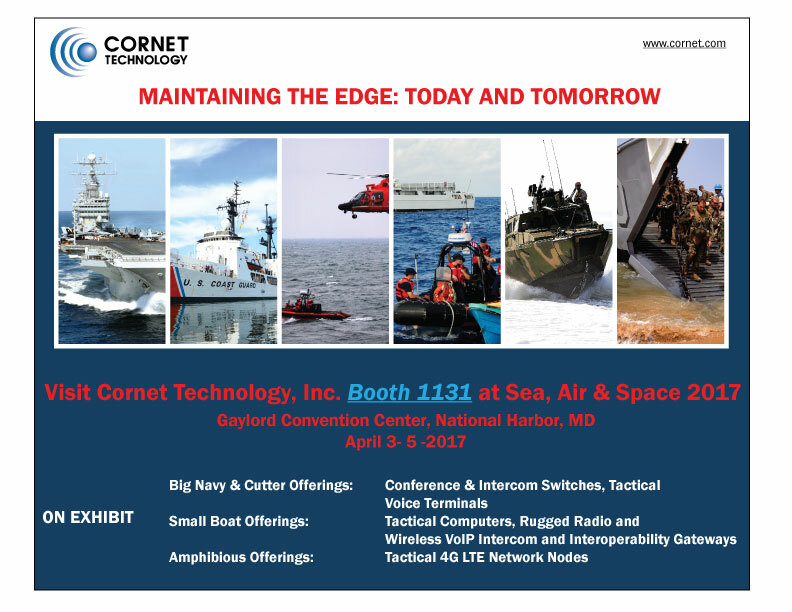 SPRINGFIELD, VA, July 29, 2016 – Cornet Technology, Inc. a designer, engineer, and manufacturer of secure/non-secure communication solutions will feature its line of 4G LTE Small Tactical IP Network Nodes (STINN) at the 2016 AFCEA TechNet Augusta Conference and Expo. The conference will be held at the Augusta Marriott at the Convention Center, Augusta, GA, August 2-4, 2016. 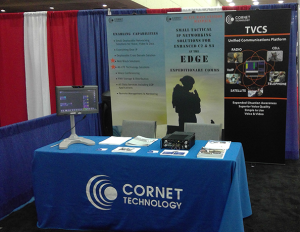 Cornet Technology is exhibiting in the Olmstead Exhibit Hall Foyer: table #T76. 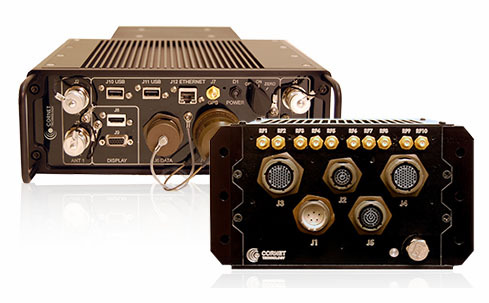 Cornet Technology will showcase its STINN manpack and command post solutions. Staff will be available to discuss how these 4G LTE base station solutions fulfill both Expeditionary and Coalition Communication requirements. Learn more about our solutions at www.cornet.com. Springfield, VA – July 7, 2016 – Cornet Technology, Inc. today announced the release of the HiCAP E24 rugged Ethernet switch its first VICTORY-compliant network switch solution. This high-performance Size, Weight, Power, and Cost (SWAP-C) optimized COTS switch is the first fully-managed Layer 2/3 Ethernet switch built for vehicle applications to provide the additional benefits of PoE. The HiCAP E24 delivers 24 triple-speed ports of managed GigE switching and offers cost-saving PoE in a tested solution that supports VICTORY standards. The benefits achieved by the HiCAP E24 offering consists of: reduced vehicle wiring, the ability to locate the device anywhere in the vehicle, increased network control and monitoring capability, as well as cost savings.